Sino-Forest Corp. may not defend itself against Ontario Securities Commission allegations of fraud because it is in the process of winding up and may not want to spend money on a legal defence. Lawyers representing the Chinese forestry company and six of its executives appeared Thursday at an OSC hearing – the first since the commission unveiled fraud allegations in May. But lawyer Robert Staley, representing Sino-Forest, said it is premature for him to discuss plans for a hearing into the allegations. What a difference a decade makes. If and when Canadian and American negotiators sit down, possibly about a year from now, to hammer out a new softwood lumber deal, they’ll be dealing with completely different circumstances than existed at the signing of the first agreement in 2006. …Although there’s little doubt U.S. agitators will continue to pursue these kinds of actions, the threat to U.S. producers from Canadian lumber exports is not what it was. …As Canada’s exports of softwood lumber to the U.S. declined, so too did Canada’s dependence on the U.S. market. The Meadow Lake mills are still in the dark three weeks after Meadow Lake’s power outage. The Meadow Lake Mechanical Pulp Mill and the Meadow Lake OSB Mill are both without power from the original outage around 10 p.m. on June 25 that left the city of Meadow Lake and surrounding communities in the dark for 19 hours. “We’re taking it in stride, that’s about all you can do,” said Parker Snyder, Plant Manager of the Meadow Lake OSB. Both mills came to a grinding halt when the power went out on June 25 causing damage to the machinery. Ft.St. James, B.C. – Three investigators from Worksafe BC will be on site at Conifex in Ft.St. James today to investigate a workplace accident that claimed the life of a Prince George man. WorkSafe BC says initial reports indicate a sub-contractor, working with Allan Scrap, was in the process of dismantling an elevated catwalk when the supports buckled and crushed the worker around 11 yesterday morning. The deceased has only been identified as a 44 year old Prince George man. Developing new, value-added products is difficult without the profits needed to attract investors, industry experts say. Consultants PwC, who track industry performance, say that even though the B.C. pulp sector turned in a relatively good performance, lumber companies were hammered by low commodity prices — and that’s on top of challenges like the mountain pine beetle and taxes on American softwood lumber sales. PwC is now analyzing data on the year, but preliminary indications are that 2011 was another dark period for the beleaguered industry. …Chronically poor returns are keeping the industry from realizing its potential, said Bromley. “We are reliant on commodity markets, but we should be extracting more value from the fibre,” he said. DRYDEN – Stephen Boon, CEP National Representative, confirms three new tentative agreements were reached Wednesday covering over 500 members from CEP Locals 105-1, 105-3 and 324 at Domtar’s Pulp Mill and Woodlands Operations in Dryden. Boon stated, “After almost 40 days of fairly challenging negotiations over the last nine months, we are pleased to have finally reached new tentative agreements with Domtar that we are able to bring back and recommend to our Mill and Woodlands Members in Dryden and Ear Falls. The proof is finally in the pudding, with a few new hires and/or more hours at most local mills in Southern Oregon. Demand and prices are generally holding. Four-year trends of lumber, logs, housing, and mortgage statistics are shown below. …Checking with some local mills, hours and employment are inching up slightly — the first time in several years. Mills are very hesitant to add employees. The Aditya Birla group has reorganised the management structure of its pulp and fibre business as it attempts to provide a sharp focus to its traditional businesses that are becoming bigger in size and global in nature. The $40-billion fibre-to-telecom group has appointed two chief operating officers to manage operations in different geographies and a new head to manage the pulp business. The Canadian Institute of Steel Construction (CISC) has set its sights on expanding its membership to bring all steel construction industry stakeholders into the fold. “Our vision is to be the voice of the entire Canadian steel construction industry,” says president Ed Whalen. “We want to be an all-encompassing organization.” At one juncture, the CISC was comprised of a “small, relatively elite group” of fabricators. But it now represents a broad-cross section of the industry — among them detailers, steel mills, service centres, erectors and suppliers as well as architects and engineers. THUNDER BAY – Leaders Ledger – Ontario Wood is an exciting new initiative from the McGuinty government that helps consumers identify and choose locally produced wood products from their local lumberyards, hardware stores and other wood product retailers. …Promoting Ontario wood just makes sense. The forest products industry helps support about 200,000 jobs in over 260 communities across our province. Getting local consumers to buy Ontario wood and wood products will benefit our forest industry and the families and communities that depend on it across the province. Columbia Forest Products and GreenWood Tree Farm Fund announced this week they’ve signed a deal to use GreedWood’s Boardman-raised poplars as a supply for hardwood veneer planes made using Columbia’s formaldehyde-free adhesive technology. The panels feature bands of poplar veneer that will be generated with a high-tech lathe installed in Boardman where GreenWood keeps its 35,000-acre, Forest Stewardship Council-certified poplar plantation and The Collins Companies manages the onsite sawmill. VISTA, CA – Eco Building Products received $100 million in backing from a Chinese bank to fund global expansion, the treated lumber products firm announced. Eco Building Products, Inc.says it received a $100 million standby letter of credit to support a major expansion in its core business, manufacturer of proprietary wood products treated with eco-friendly proprietary chemistry to protect against fire, mold, fungus, rot-decay, insects and termites. Harvesting trees, replanting seedlings and constantly regrowing our forests for future generations has always been a foundation of our economy. And it will be even more so in 2035. …As we look toward 2035, there’s no doubt the business of sustainably growing and harvesting our forests will continue to be a dominant industry, one that offers young British Columbians well-paying and exciting jobs for their future. The proof for this optimism is both in the hard numbers but also in the forestry industry’s proven ability to respond to shifting markets. The last fast few years have demonstrated this beyond doubt. When John Innes, dean of the faculty of forestry at the University of B.C., talks about a sustainable forestry sector, he is both encouraged and concerned about what he sees unfolding in the province’s forests, educational institutions and mills. First, he said in a phone interview from a London forestry conference, he is encouraged by the attitudes of the students now enrolled in faculty programs and by the innovative changes taking place within much of the industry itself. 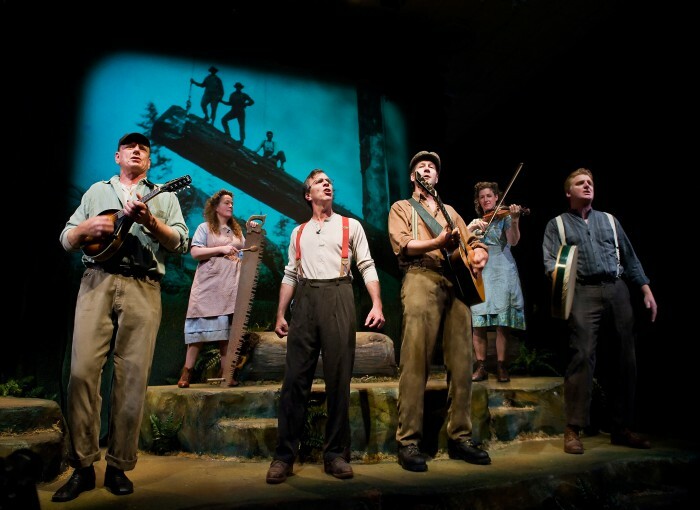 Based on the logger poetry of Robert E. Swanson, the Bard of the Woods, this amazingly talented ensemble has created a show of songs and stories played against a multi-media backdrop of rarely seen archival imagery. Swanson worked for many years as a logger, and then as a railroad safety inspector for the BC government. Swanson was best known however for his logging poetry. During his forestry career Swanson visited every logging camp and mill operation on the coast and spent long evenings bull slinging with the legends of logging. When Canfor Corp. president Don Kayne talks to customers, whether in the United States or in China, they all ask the same question: who has the fibre to supply them with lumber in the future? Customers follow the news. They have seen the annual timber harvest in British Columbia reduced because of the mountain pine beetle infestation. They know the B.C. government is considering controversial measures such as logging in forest reserves to keep mills supplied with timber. It raises questions about B.C.’s ability to supply global markets in the years ahead. “Who has the fibre. That’s what they are asking now,” Kayne said in an interview at the company’s Marpole head office. In resource towns like Castlegar in the West Kootenay, the future of B.C.’s forest industry is already starting to unfold. It’s all about sustainability and it’s on display in the lower emissions, shrinking environmental footprint and diversified revenue stream at Mercer International’s Celgar pulp mill, one of a number of B.C. mills that is beginning to tap the province’s forests for new bio-products — from energy to bio-chemicals. …Bioproducts could eventually be used not just for energy, but to build homes, planes and more. What’s unfolding at Celgar is just the beginning, said David Gandossi, Mercer senior vice-president. From bucksaws to chainsaws to mechanized falling machines, British Columbia’s logging industry has seen huge advances since the founding of the provincial government’s forest service in 1912. …At an FPInnovations research lab located on the University of B.C.’s Point Grey campus, forest operations program manager Doug Bennett reels off a list of projects that resonates with anyone tracking the popularity of high-resolution mapping, cellphone apps and global positioning systems in other sectors of the economy. Provincial Minister of Forests, Lands and Natural Resources Steve Thomson is encouraged by the recent $6.7 million investment Western Forest Products committed to its Alberni Pacific Division mill. He was in Port Alberni for the announcement, Wednesday, and called it a sign that the lumber and forestry industry is coming out of the toughest recession it has faced. Firefighters are still working to gain control over a forest fire in southwest Ottawa. Crews have been battling the blaze just west of Moodie Drive since about 3 p.m. on Thursday. It’s estimated that the fire has destroyed about 40 hectares of bush. No injuries have been reported and nearby residents who had been evacuated have since returned to their homes. A Restricted Fire Zone Order has been declared for Northeasterm Ontario in an area north of the French and Mattawa rivers, east to the Quebec border, and then to the western boundary of the Northeast Region. The order is in place to reduce the risk of human-caused wildfires during a period of high fire hazard. On July 13 2002, lightning storms sparked a series of wildfires in southwest Oregon. The smaller blazes merged and were eventually dubbed the Biscuit Fire. The fire lasted five months. It consumed 700 square miles from the edge of the California Redwoods to Oregon’s Rogue River. It was one of the largest recorded fires in the Northwest. …From trees that can literally resurrect themselves to vanishing soil, here are five surprising lessons ecologists have learned from the Biscuit Fire and recovery. COLORADO SPRINGS — For a decade, the Colorado Springs Fire Department has worked aggressively to protect more than 36,000 vulnerable homes from wildfire in the foothills of Pikes Peak. When the fire everyone feared roared into the city last month, those efforts failed to save nearly 350 houses in one neighborhood — but succeeded spectacularly in another. In Cedar Heights, a hillside neighborhood that the fire approached from three directions, many homes were rated as “extreme” risks in a wildfire, the worst possible rating. Yet not one house burned, thanks to a forest-thinning mitigation project that stopped the fire a half-mile away. When Kathryn and Susie Kemp, sisters in their 60s, moved from the red dirt desert lands of Utah to lush, green Cottage Grove, Ore., they knew very little about how to sustainably manage their eight acres of woodlands. “We were newbies, but we wanted to fully embrace the experience of forest ownership,” Kathryn Kemp said. 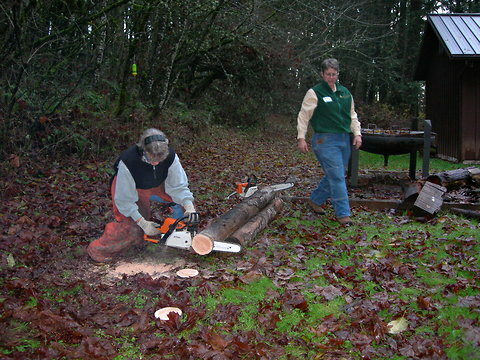 They would soon would find camaraderie and support through the Oregon Women Owning Woodlands Network, an education program founded in 2006 by the Oregon State University forestry extension program to address the needs of woodland owners like themselves. BOISE — Standing at the National Interagency Fire Center (NIFC) headquarters in Boise at the height of firefighting season could easily make your head spin. …The biggest of those planes to refuel are the U.S. military’s specially-built C-130 aircraft. “We’re here to support the forest service,” said Major Ron Yochum, the commander of the C-130 Modular Airborne Firefighting Systems (MAFFS). “They call us when they need us. We’re always ready and willing to do this. Black Hills Energy was recently honored by Trees Forever at its annual celebration and awards ceremony. Black Hills received a special President’s Award from the statewide nonprofit environmental organization. Black Hills Energy was recognized for its 20-year tree planting partnership with Trees Forever, and their joint Power of Trees program in Iowa. The Power of Trees program promotes the many energy-saving, environmental and economic benefits that trees provide, and offers grant funding and staff support to community tree planting projects in Black Hills Energy’s Iowa service territory. PALMYRA, Maine — An Athens man who violated a state wood harvesting rule while working on private land in Palmyra has reached a settlement with the Maine Forest Service. Gerhard Grignon has agreed to pay a $2,000 civil penalty for clear-cutting 30 acres that did not have a harvest plan prepared by a licensed forester before harvest, as required by the state’s Forest Practices Act. The land was cut over the course of 2010 and 2011, said Jim Ecker, Maine Forest Service regional enforcement coordinator. With drought conditions being reported in many areas of the state, newly planted trees could be at risk from several species of opportunistic borers. The borers belong to the family buprestidae and include: flatheaded appletree borer (Chrysobothris femorata); flatheaded honeylocust borer (Agrilus difficilis); and the two-lined chestnut borer (A.bilineatus). Buprestid adults generally are referred to as “metallic wood borers” owing to their highly reflective coloration. Adults lay eggs in bark crevices. Their larvae are known as “flatheaded borers” because their first thoracic segment is broadly flattened. GRACEVILLE, Fla. – A fire starting in one of Rex Lumber’s kilns around 5:30 p.m. Thursday, still had the area’s first responders trying to extinguish the blaze four hours later. Graceville Fire Chief Tommy Dennis said the cause of the fire was still unknown. At 9 p.m., firefighters were still trying to remove wood from inside the structure, while shooting water from above and to the side of it, but they had to evacuate as the roof started caving in. …Charles McRae, one of Rex Lumber’s owners, said these types of fires are common in kilns. He said a kiln essentially dries out the wood used in production. RIO DE JANEIRO, Brazil – The forestry world is currently witnessing the birth of a new coalition for change, where companies, environmental groups and governments from both the developed and developing world are all agreeing on the need to eliminate illegally logged timber from markets – and this coalition of widely diverging interests is essential for building the future of forest certification, say experts. … The key to certification’s success, says Ben Cashore, is support from broad ‘bootleggers and Baptists’ coalitions; so-called after the alliance that emerged during the Prohibition era in the United States between liquor smugglers and preachers who wanted – for very different reasons – to maintain the ban on alcohol. An environment group outside Tasmania’s forestry peace talks has issued a new list of conditions it wants included in any peace deal. The forestry peace talks were due to conclude by the end of June but the deadline has since been extended until July 23. Markets for Change say a peace deal must secure protection for high conservation value forests and reduce logging volumes. It also wants greater biodiversity protection for forests that will still be logged. Group spokeswoman Peg Putt has told ABC Local Radio the list was not an ultimatum, but a reminder of what environment groups in the talks must achieve. OTTAWA — The Harper government has deployed a network of Canadian diplomats to lobby Fortune 500 companies in the United States in order to counter a global warming campaign launched by an environmental advocacy group targeting the oilsands industry, says a newly-released internal memorandum from Natural Resources Canada. “The (diplomatic) posts have offered briefings to targeted companies to counter misinformation, and in certain cases, to provide background to likely targets which have yet to be approached by ForestEthics,” said the memo to Natural Resources Canada Deputy Minister Serge Dupont from Mark Corey, an assistant deputy minister. A genetics study based at the University of B.C. is looking for ways to ensure the long-term survival of B.C.’s forests. The $4.7-million, three-year study looks at the challenges B.C.’s most economically important tree species — lodgepole pine and Interior spruce — face amid some stunning environmental changes that are happening as a result of climate change. …“In my opinion, climate change is the biggest challenge facing our forests and our forest management,” said Sally Aitken, a UBC forest sciences professor and genome researcher who leads the project. The U.S. will probably allow states to regulate emissions from existing coal-fired power plants using carbon markets, according to the president of the International Emissions Trading Association. The nation’s Environmental Protection Agency is set to let states including New York and California regulate emissions in their own way rather than via a federal power station emission standard, assuming President Barack Obama wins a second term in office, said IETA president Dirk Forrister, a former climate adviser to U.S. President Bill Clinton. During the Great Recession one of the fastest growing sectors of the U.S. wood-to-energy market has involved wood pellet facilities with products targeted for the European Union. Two new reports issued today by the Environmental Defense Fund and the Pinchot Institute for Conservation are designed to shed light on the complex nature of this segment of the renewable energy market. “The U.S. Endowment for Forestry and Communities funded these reviews through our on-going collaboration with the USDA Forest Service to plumb the potential of woody biomass markets to help retain forests as forests and grow family-supporting jobs in rural forested communities,” said Endowment President Carlton Owen. MUMBAI: The government, within three months, would decide on a proposal of offering “credits” to residents for planting trees, forest minister Bhaskar Jadhav said on Thursday. Modelled on the carbon credit concept, the social forestry department has proposed to offer incentives, called “tree credits”, to individuals, corporates, institutions and industries that grow as well as protect trees on plots owned by them or in their possession.